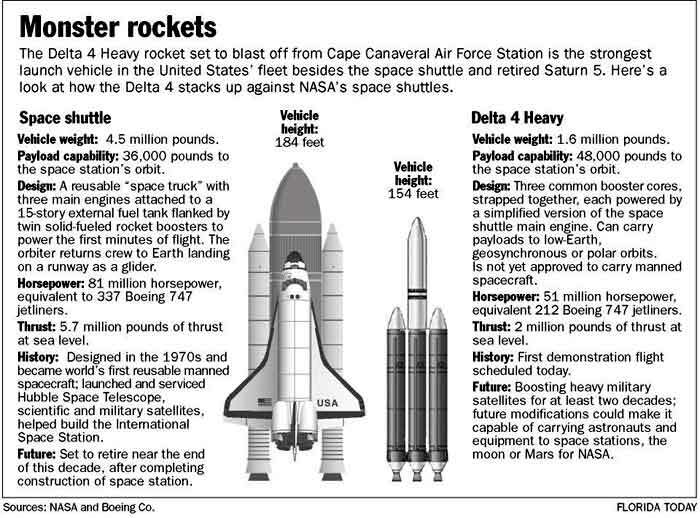 ^ "Delta IV User's Guide". ULA. June 2013. 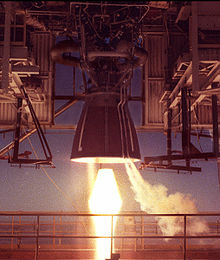 ^ United Launch Alliance Transaction completed 互联网档案馆的存檔，存档日期2008-02-22. ^ L-3 Space & Navigation's RIFCA Trihex 互联网档案馆的存檔，存档日期2006-10-15. 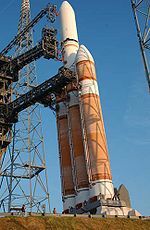 ^ Delta IV may return to commercial launches 互联网档案馆的存檔，存档日期2006-11-14. ^ 7.0 7.1 Delta Launch 310 -- Delta IV Heavy Demo Media Kit - Delta Growth Options (PDF). Boeing. （原始内容 (PDF)存档于2011-05-24）. ^ US Air Force - EELV Fact Sheets 互联网档案馆的存檔，存档日期2014-04-27. ^ Delta IV Small on Astronautix.com 互联网档案馆的存檔，存档日期2006-11-05. ^ Boeing Signs agreement for Delta IV Integration Facility 互联网档案馆的存檔，存档日期2006-11-21. 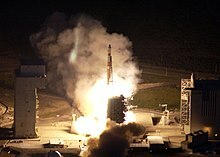 ^ Delta IV Launch Facilities 互联网档案馆的存檔，存档日期2006-07-03. ^ The DemoSat payload. Spaceflight Now. 2004-12-01. ^ Delta Pad Damage Assessed After Fuel Leak. Aviation Week. ^ Spaceflight Now - Tracking Station - Worldwide launch schedule. [2008-10-13]. （原始内容存档于2010-06-04）. ^ Schaub, Michael B. Mission Set Database. Schwartz, Patrick C. NASA GSFC/Honeywell TSI. [2008-10-13]. （原始内容存档于2009-03-20）. ^ Delta 4 deploys an advanced weather observatory. Spaceflight Now. June 27, 2009. ^ NASA and NOAA's GOES-O Satellite Successfully Launched. NASA KSC. June 27, 2009. ^ 21.0 21.1 New communications craft launched for U.S. military. Spaceflight Now. December 5, 2009. ^ Teaming of Delta 4 rocket and GOES a sweet success. Spaceflight Now. 2010-03-04. ^ First-of-its-kind satellite for GPS launched into space. Spaceflight Now. 2010-05-28. ^ Huge rocket launches secret U.S. spy satellite. MSNBC.com. 22 November 2010 [22 November 2010]. ^ United Launch Alliance Launches First West Coast Delta IV Heavy Mission. United Launch Alliance. 20 January 2011 [21 January 2011]. （原始内容存档于2013年12月7日）. ^ ULA Successfully launches Fourth NRO mission in Six months. United Launch Alliance. 11 March 2011 [12 March 2011]. （原始内容存档于2013年12月7日）. ^ United Launch Alliance Marks the 50th Successful GPS Launch for the Air Force with the Delivery of the GPS IIF-2 Mission to orbit. United Launch Alliance. 16 July 2011 [16 July 2011]. （原始内容存档于2013年12月7日）. ^ Justin Ray. Delta 4-Heavy rocket fires away from Cape Canaveral. Spaceflight Now (http://www.spaceflightnow.com). 2007-11-11 [2008-05-28].